Processes module Manage a group Properties - Continue to "Group selection"
A specific group is managed with this option. Opens a dialog where a group can be selected from Intrexx Share. The group can also be read from a data field. To do that, the Intrexx Share group's GUID needs to be stored in a data field. Select this field from the drop-down list. A system value that provides the GUID of the Intrexx Share group can be defined here. All of these options relate to the members of a group apart from the moderator. The moderator is always kept as a member, regardless of which action you perform using the process element Manage a group. From Intrexx Share 2.0, the moderator is set directly. In previous versions, the selected user received an invitation that they first had to accept to become the moderator. If the selected user still is not a member of the group, they will automatically be made one. 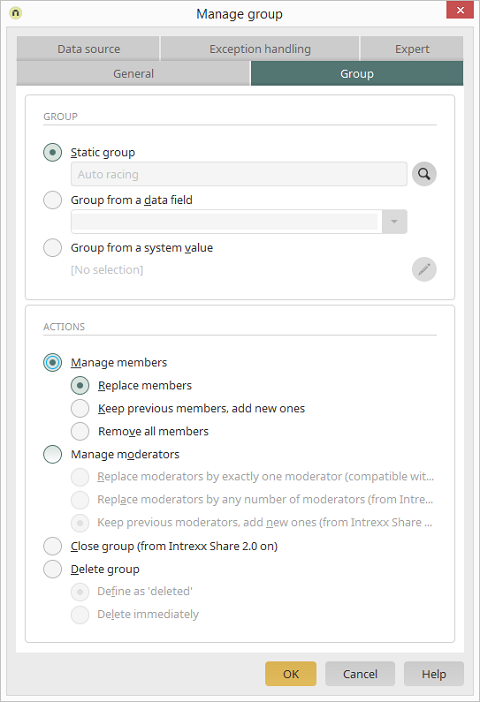 From Intrexx Share 2.0, groups can be closed. Feeds and comments cannot be made for closed groups. Feed actions, such as "liking", are also switched off. You can select the behavior for the deletion here. The group is kept and can be restored if necessary. The group is deleted irrevocably.